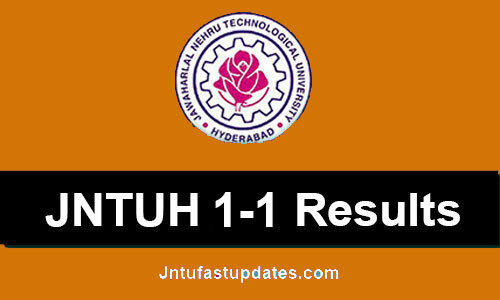 JNTUH 1-1 Results Dec 2018: JNTU Hyderabad B.Tech 1-1 Sem R18 , R16 and 1st Year R13, R09 Regular/Supply Exam Results Dec 2018 are declared at jntuhresults.in. Check JNTUH 1st Year Results 2018, jntuh 1-1 r18 result below. The candidates who have appeared for the JNTUH B.Tech 1-1 Semester R18, R16, R13, R09 Regular/Supply Examination, Dec 2018 can visit the official website provided above to check and download their results. JNTU Hyderabad has successfully conducted B.Tech I year I Sem and I Year Regular/Supplementary examinations in the month of December 2018. Large Number of students were written these examinations. The Following Examination results are declared by JNTUH university. Students those who are written First year First Semester exams, they are eagerly waiting for the JNTUH 1-1 Results Dec 2018. Already JNTUH has released the JNTUH B.Tech 2-1 Regular/Supply Results and JNTUH B.tech 3-1 Regular/Supplementary Results Dec 2018. Now they are keenly observing for their JNTUH B.Tech 1st year Results. JNTU Hyderabad B.Tech 1-1 Semester Regular/Supplementary Examinations December 2018 Spot Valuation to commence from 21st December 2018. JNTUH 1-1 sem & 1st Year Results 2018 Release Date? Last Date for Recounting / Revaluation Date: 23-02-2019. How to Check JNTUH 1-1 Results Dec 2018 @ Jntuhresults.in? As the university has finally come up with the Results of the 11st year examination that has been held in the month of December 2018, it is the time that the students have to follow the instructions that we provided below to access and Download their marks sheets from the official website quickly. 1 ) Visit the official results website of JNTU Hyderabad using the direct link, www.jntuh.ac.in. 2) After opening the homepage, you are required to click on the “JNTUH 1-1 Results 2018” link. 3) You will be opening the results link, in which you are required to select any of the two servers available. 4) Enter your hall ticket number, Date of Birth and other particulars required in the fields provided and click on ‘Enter’. 5) You can find your marks sheets being displayed on the screen along with your name. 6) Take a printout of your marks sheet for future use for Applying Revaluation/ Recounting / Supplementary Exams. 7) You will get JNTUH 1st year Results Column wise with Student Name. JNTUH 1st year Results 2018. About JNTU Hyderabad University: JNTUH, located in Kukatpally, has a Grade ‘A’ certification from the National Assessment and Accreditation Council (NAAC). It has been in existence for more than 40 years. The JNTU College of Engineering, Results’Hyderabad (CEH), JNTU College of Engineering, Karimnagar, JNTU School of Information Technology (SIT), JNTU Institute of Science and Technology (IST), JNTU School of Management Studies (SMS), and the JNTU Academic Staff College (ASC). 1.3 JNTUH 1-1 sem & 1st Year Results 2018 Release Date? 1.4 How to Check JNTUH 1-1 Results Dec 2018 @ Jntuhresults.in? Hi I sir ,,my 1-2 supply results not showing, showing my Hall ticket number as invalid ,. ………..what the reason for this ..
Sir Iam Anil , r13 1st year physics exam I written 26 pages but I got 0 marks , worst correction .miru asalu na paper chusara 0 marks ela vasthay .madhi poor family .mi university chadhivi na life spoil ayipoind 2013batch nadhi. Writing 26 pages doesn't guarantee you pass, it depends on what you have written. Although zero marks is unexpected. See and corret the paper .